Governor, senator, and educator Terry Sanford (1917-1998) was characterized by his “political adroitness, personal magnetism, and common touch,” qualities that made him an effective and empathetic leader at local, state, and national levels. After serving in World War II and receiving the Bronze Star and Purple Heart, he earned his law degree from the University of North Carolina at Chapel Hill in 1946. He was assistant director of the Institute of Government at UNC-Chapel Hill from 1946 to 1948. 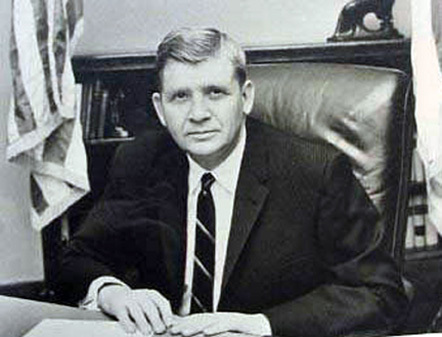 Sanford was elected North Carolina state senator for the 1953-1955 term and served as governor of the state from 1961 to 1965. In the gubernatorial campaign, Sanford advocated increased spending on education and, days after his inauguration, outlined what he termed his “Quality Education Program.” He advocated for establishing public colleges in Asheville, Charlotte, and Wilmington, conceived of the idea of the Governor’s School of North Carolina, a six-week residential summer program for gifted high school students; established the North Carolina School of the Arts; and created a state system of community colleges, vocational training centers, and technical institutes. Sanford was a proponent of desegregation and established the North Carolina Fund, a five-year, grant and federally funded antipoverty program with 11 community action agencies across the state. Sanford left the governor’s office in 1965 and served as president of Duke University from 1969 to 1985. He ran for president twice and was elected to the United States Senate in 1986. He died in 1998 and is interred in Duke Chapel. His long and distinguished career of public service as Governor, President of Duke University, and U.S. Senator helped build the New South and served as an inspiration to me and an entire generation of Americans. He stood for civil rights, education for all, and progressive economic development. His work and his influence literally changed the face and future of the South, making him one of the most influential Americans of the last 50 years. Most important, he was a wonderful man who fought for the right things in the right way.